The top cast from Japan! 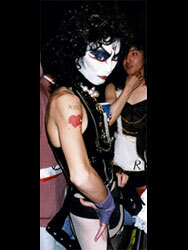 "LIP'S" is a RHPS cast based in Tokyo, Japan. This cast is quite active in the Rocky Horror Picture Show scene. They perform their usual weekly shows to the movie in their theater, perform LIVE "Rocky Horror Shows" withOUT the movie, run their own Japanese RHPS Fan Club, attened live productions of the stage play whenever they can, attened RHPS conventions, travel to other casts AND keep up with correspondance with other fans around the world as well as perform in their own band, "Transexual Glamour." When it comes to being a hard-working cast, "LIP'S" is one of the better examples of what a cast can do. Talent, energy, heart... this cast has it all. 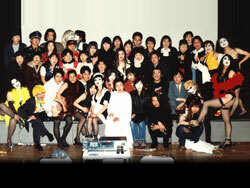 It was the 20th Anniversary out in California, and I was about to met members of the Japanese cast for the first time. Several members of the New York City cast walked into the Roxy on friday night. Shock Treatment was playing on the monitors, the place was jam-packed with Rocky Horror fans from all over. I was dressed as "Bert Schnick" from Shock Treatment and Mad Man Mike Ellenbogen was dressed as "Cosmo McKinley." We didn't get two feet into the place before we heard a high-pitched squeal of delight. We jerked our heads to one side and who did we see? A "Francine" and "Brenda" (the cheerleaders from Shock Treatment) facing us. They had huge smiles and were jumping up and down with an energy that I haven't seen since I was a thirteen year old. I was impressed right away: both costumes were accurate, and the "Francine" had even gone so far as to dye her facial skin the correct shade of chocolate to match the Francine from the movie, as well as covering her arms and hands with the correct shade of glove. These girls knew their costumes. "You two look great!" I said. The girl smiled and looked embarassed. "What cast are you from?" I asked. "I don't speak English well," she said in heavily accented American English. That didn't stop me and Mad Man. These two girls looked damned good and we were going to get them up on stage with us. We did "A Tribute to Shock Treatment" that night, and part of the songs we did included the two Cheerleaders singing "Janet Janet Janet Janet" just before "Me of Me." We wanted them up there to sing that part, but how to communicate this to someone who didn't speak the language and vice versa? Easy as pie. The love of Rocky Horror is a universal language, and we had no problems. I pointed at the stage, then at them, then at the both of us and asked, "Want to go up with us?" No response. I wasn't being clear enough. And suddenly it hit me. I pointed to the stage, to me and Mike, to the two of them, back to the stage and asked "Janet Janet Janet?" and pointed at the stage again. The girls' mouths dropped open and their eyes got wide. "Janet Janet Janet?" she asked with dawning comprehension. I smiled and said "Hai", the only Japanese word I know (it means yes). The Francine grabbed the Brenda, the Brenda grabbed back and both jumped up in the air like a couple of kids and screamed "JANET JANET JANET!!!" together. They went up with us and did a great job. It was then that I learned that this was Sachiko Miyama and her sidekick Hiromi. You two RULE! And I didn't know it, but they had a lot more to do at the con. The band played the next night and all of the Japanese cast were all over the place. Their enthusiasm and energy seemed boundless, their spirit was strong and they made quite a lasting impression on the people they met that night. "LIP'S" can be seen in Sal Piro's books CREATURES OF THE NIGHT and CREATURES OF THE NIGHT II.